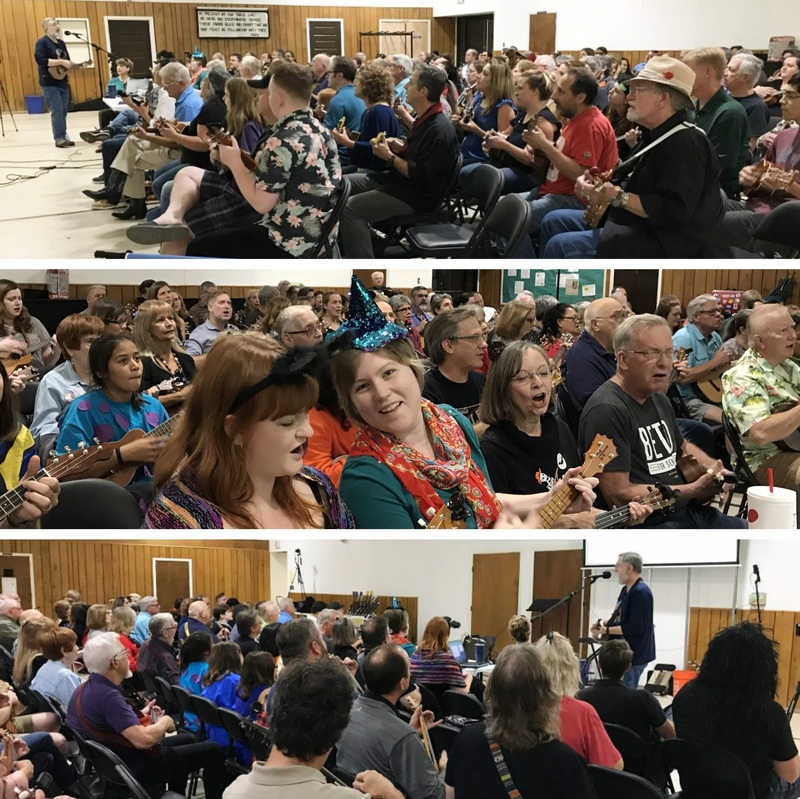 Our meeting kicked off with introductions, local ukulele event announcements and our warm-up, feel-good song (Bob Marley’s “Three Little Birds”). Bob introduced us to a special guest – one of Austin’s best saxophone players, Paul Klemperer. They performed Men at Work’s “Who Can It Be Now?” to demonstrate the arrangement Bob had prepared for us. Bob led the group through several helpful exercises for the strumming pattern, chord progressions and vocal harmonies. As the group played the song through a few times, we sounded better and better each time. With the assistance of Paul Klemperer on sax and Kevin Carroll on U-bass, we recorded the song to share with all of our ukulele-loving friends on YouTube. Check it out! To play along with us, you can download the lyrics and chords for our arrangement of “Who Can It Be Now?” or download a copy of the presentation and instruction guide (what we project on the screen for all to follow along, including exercises and drills). We loved the extraordinary talents of our open mic participants, who shared a wonderfully eclectic mix of songs that included a duet on a cover of a Swedish band, a Halloween-appropriate 1960’s cover (“Haunted House,”) a couple of original love songs from Colombia and Austin, and a great cover of a humorous Roger Miller tune. Thank you to Erin and Gabrielle, Walter, Camilo, Curt and Roger for sharing these lovely performances with us. 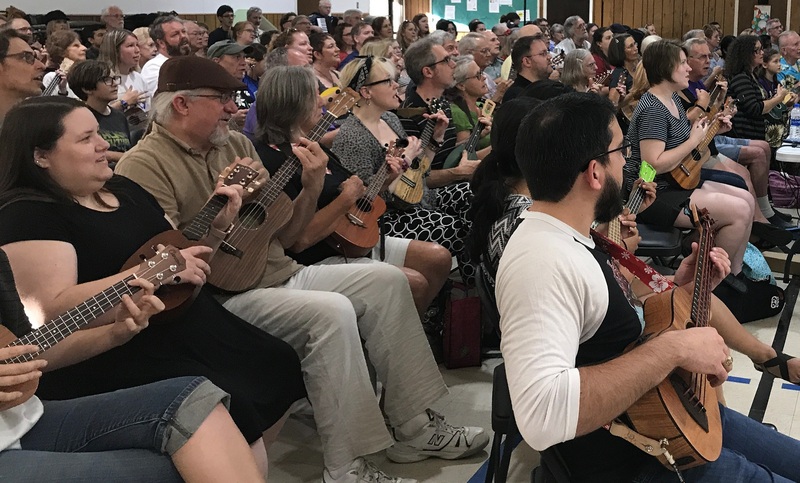 This entry was posted in AUS activities on October 15, 2018 by Austin Ukulele Society. 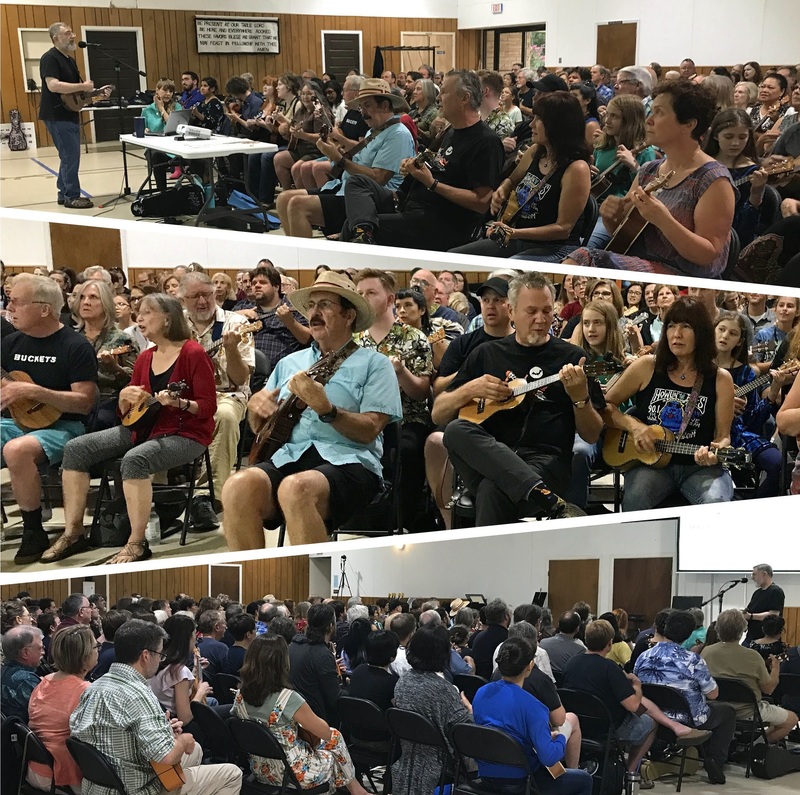 The evening began with introductions and local ukulele news of other group playing opportunities and performances around town, including the upcoming ukulele tribute to Willie Nelson (Uketania 9 – Ukulele Willie) on Wednesday, September 19. We warmed up with Bob Marley’s “Three Little Birds,” and then our Bob G. performed Nick Lowe’s “Cruel to Be Kind” to demonstrate the arrangement we’d be learning. Bob led the group through exercises he’d prepared to help everyone get familiar with the strumming pattern, chord progressions and harmonizing opportunities. When we played the song through a few times, we sounded terrific. 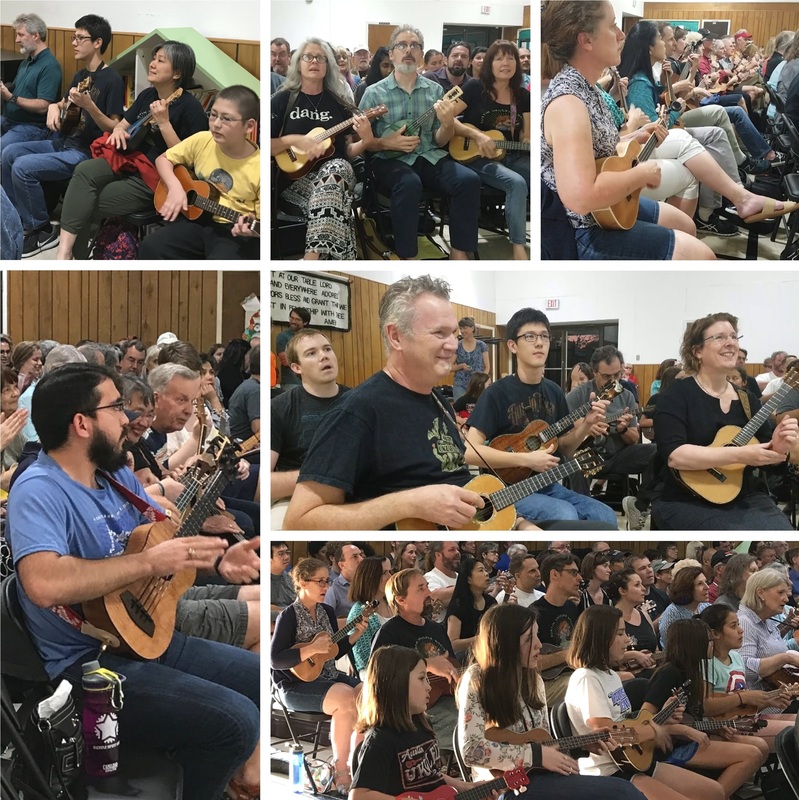 After the open mic part of the meeting, we played and recorded “Cruel to Be Kind” to share with our ukulele friends around the world! To play along with us, you can download the lyrics and chords for our arrangement of “Cruel To Be Kind” or download a copy of the presentation and instruction guide (what we project on the screen for all to follow along, including exercises and drills). We enjoyed varied and creative covers of classic tunes from the 1930s through the 1970s, by Paul, Kent, Class Act, The John Davenport and the Austin Ukestra. 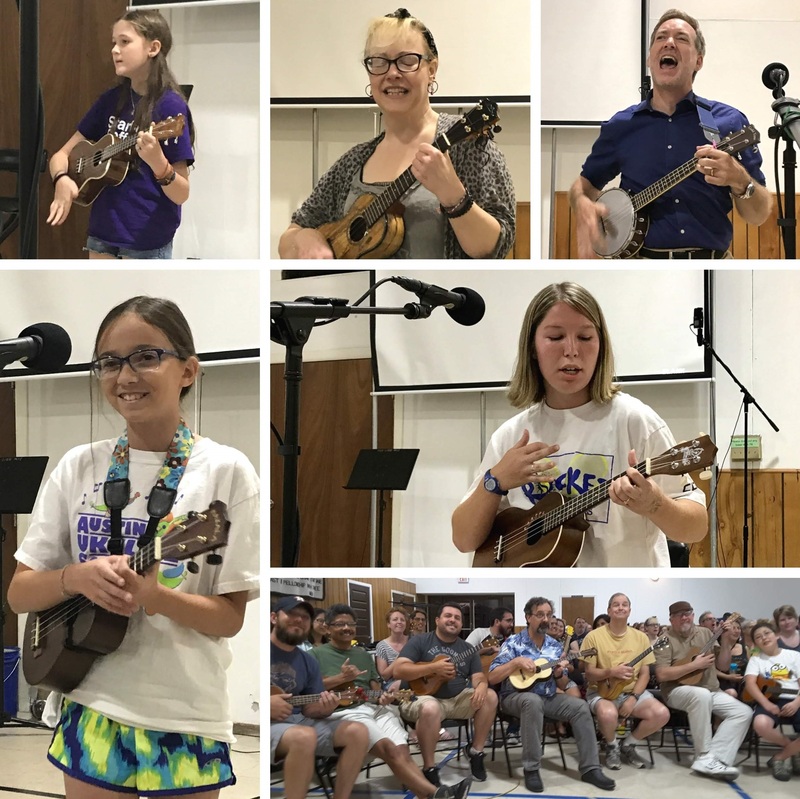 This entry was posted in AUS activities on September 17, 2018 by Austin Ukulele Society. Before Bob began teaching us this great pop rock hit, we kicked off the meeting with introductions, local ukulele news and our warmup song that always lifts our spirits and voices, Bob Marley’s “Three Little Birds.” Then Bob shared some info about the multi-layered musicianship and vocals in “I Could Never Take the Place of Your Man” and performed it for us as a demonstration of the arrangement. Bob took us through some very helpful chord progressions, strumming patterns, picking options, and harmonizing possibilities. We practiced the song, getting better and better each time, and recorded it to share with our ukulele friends around the globe. We owe a big thanks to Aaron Lewis for his U-bass accompaniment and hope you enjoy our cover of this Prince classic. To play along with us, you can download the lyrics and chords for our arrangement of “I Could Never Take the Place of Your Man” or download a copy of the presentation and instruction guide (what we project on the screen for all to follow along, including exercises and drills). We were delighted by our wonderful open mic participants! Matilda, Mason, Rodger, Helen and Demi all shared fantastic renditions of both modern and timeless tunes – we are so grateful for their willingness to do so. 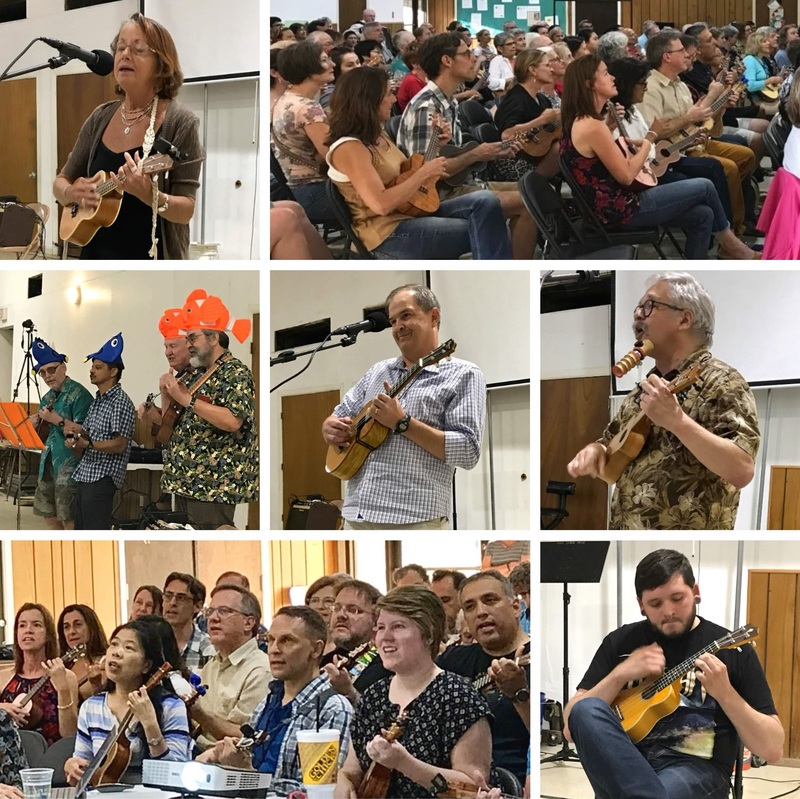 This entry was posted in AUS activities on July 16, 2018 by Austin Ukulele Society. June 14, 2018: Up On the Roof! 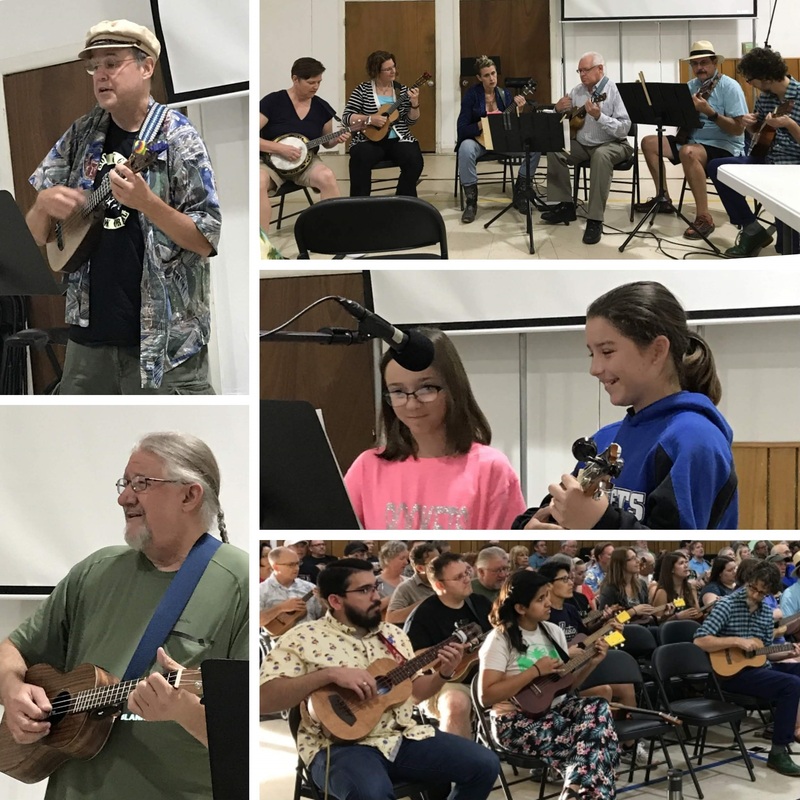 On a breezy and warm June night, 150 or so ukulele players learned to sing and strum a lovely rendition of Carole King’s classic, “Up on the Roof,” first made famous by The Drifters in 1962. 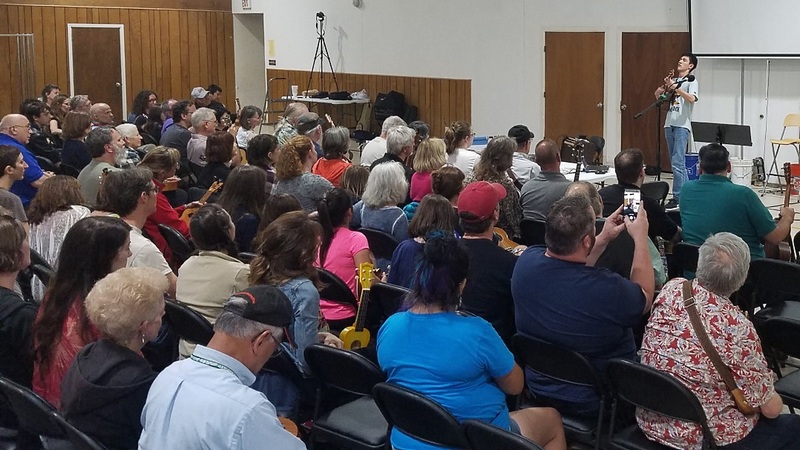 Before we got busy strumming, we kicked off the meeting with introductions and local ukulele news, including an announcement about a workshop and concert Bob Guz will lead on Friday, July 13th (more info on that coming soon!). The group then enjoyed warming up their fingers and voices with Bob Marley’s always uplifting “Three Little Birds.” Then Bob took us through some very helpful chord progression exercises as well as his recommended strumming pattern for “Up on the Roof.” When we put the song all together, and with the great accompaniment of Aaron Lewis on U-bass, we were sounding fantastic! After a few more practice run-throughs we recorded it for our YouTube channel. We hope you enjoy it! To play along with us, you can download the lyrics and chords for our arrangement of “Up On the Roof” or download a copy of the presentation and instruction guide (what we project on the screen for all to follow along, including exercises and drills). 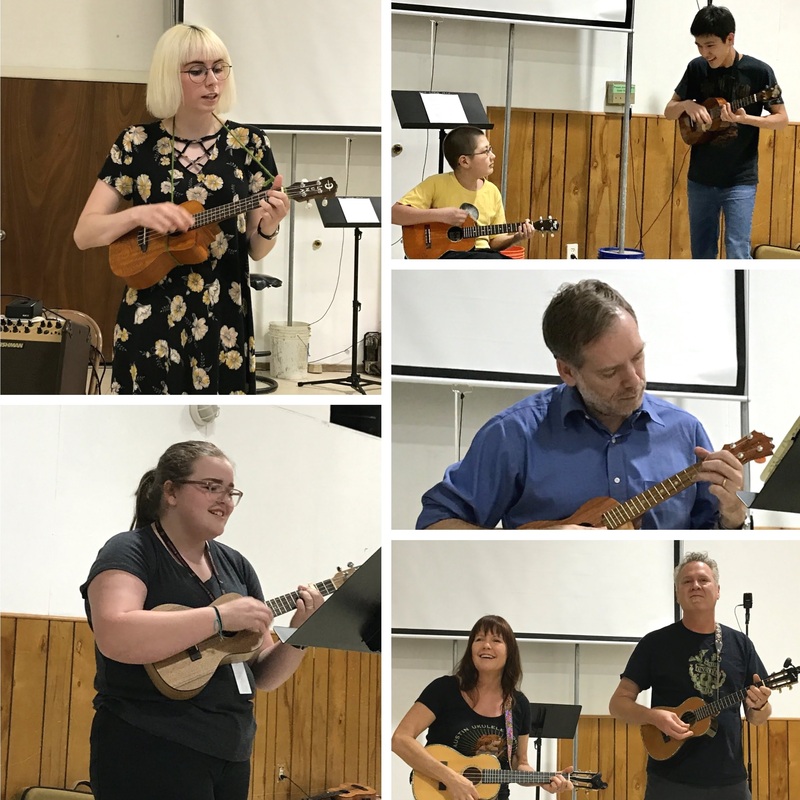 We were also treated to the terrific talents of our open mic participants: Cindi, Jay, Tuesday Ukulele Group (TUG) members, Chris, and Walter. With creative covers and impressive originals to boot, we felt fortunate to hear such great music. 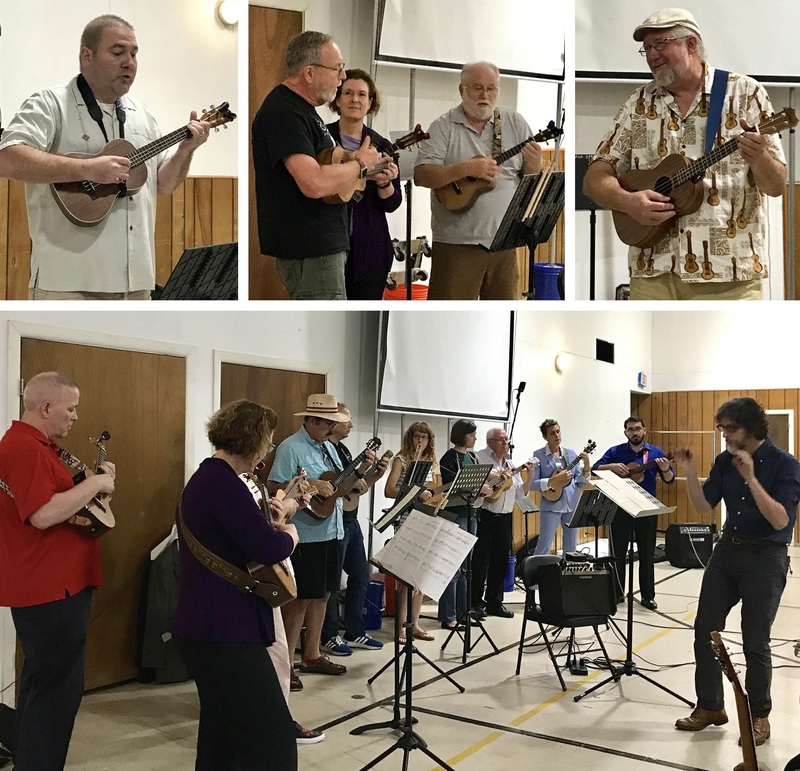 This entry was posted in AUS activities on June 18, 2018 by Austin Ukulele Society. May 10, 2018: Rebels Just for Kicks! 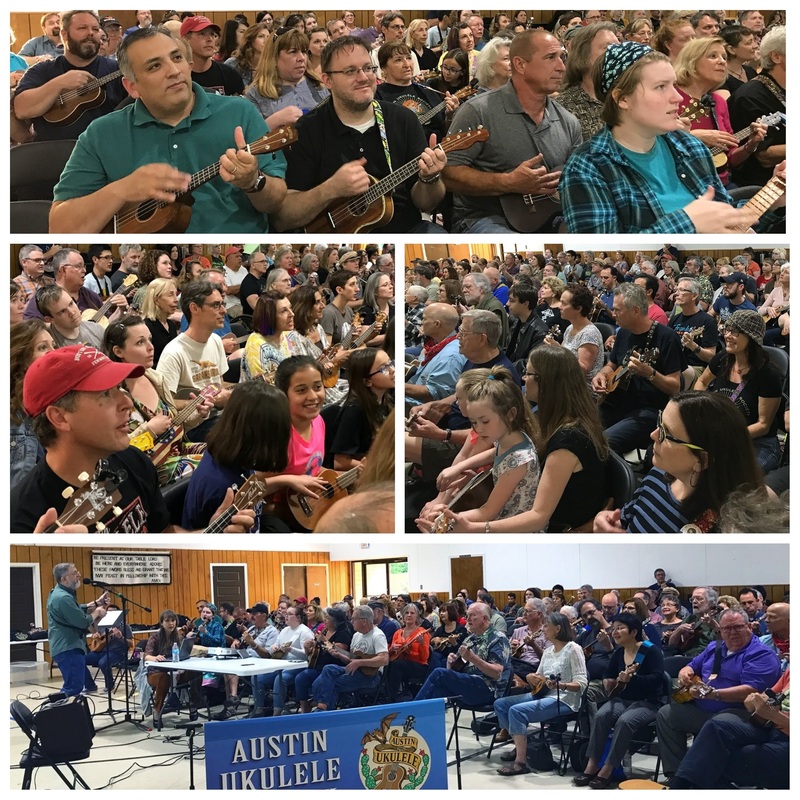 The May 2018 Austin Ukulele Society meeting was a blast, with about 160 ukulele players kicking it Portugal. The Man-style by learning to strum and sing their huge hit “Feel It Still“! To help introduce us to our new song of the month, Bob performed, along with Aaron Lewis on bass, Portugal. The Man’s “Feel It Still.” Bob explained that there were only two chord progressions in the song and provided some helpful exercise drills, so we all got comfortable with the chord transitions quickly. Afterward, Bob took us through some harmonizing options, and we spent some time playing and singing the song. After a few times through, we were sounding really great – so we recorded it and and are thrilled to share it with our ukulele friends around the globe, on YouTube. To play along with us, you can download the lyrics and chords for our arrangement of “Feel It Still” or download a copy of the presentation and instruction guide (what we project on the screen for all to follow along, including exercises and drills). Once we were feeling comfortable with “Feel It Still”, we took some time to enjoy the very talented open mic participants! Christi, Sho and Shin, Gaige, Roger, and Kathy and Bill all performed a diverse selection of very creative and cool cover tunes. 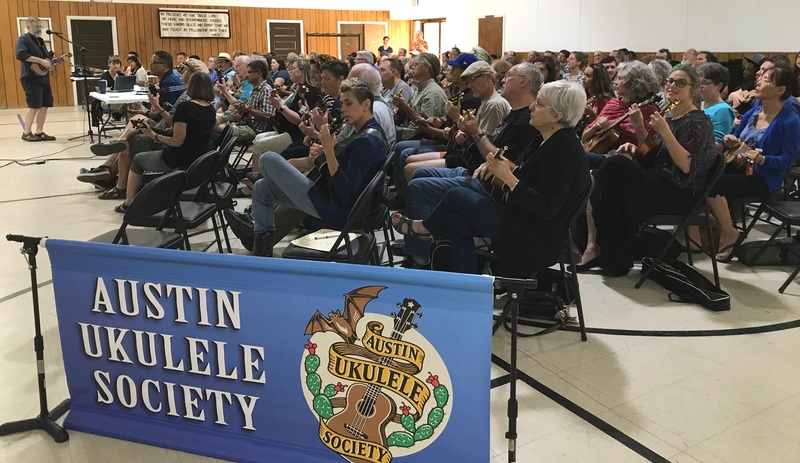 This entry was posted in AUS activities on May 14, 2018 by Austin Ukulele Society. April 12, 2018: The Mavericks! 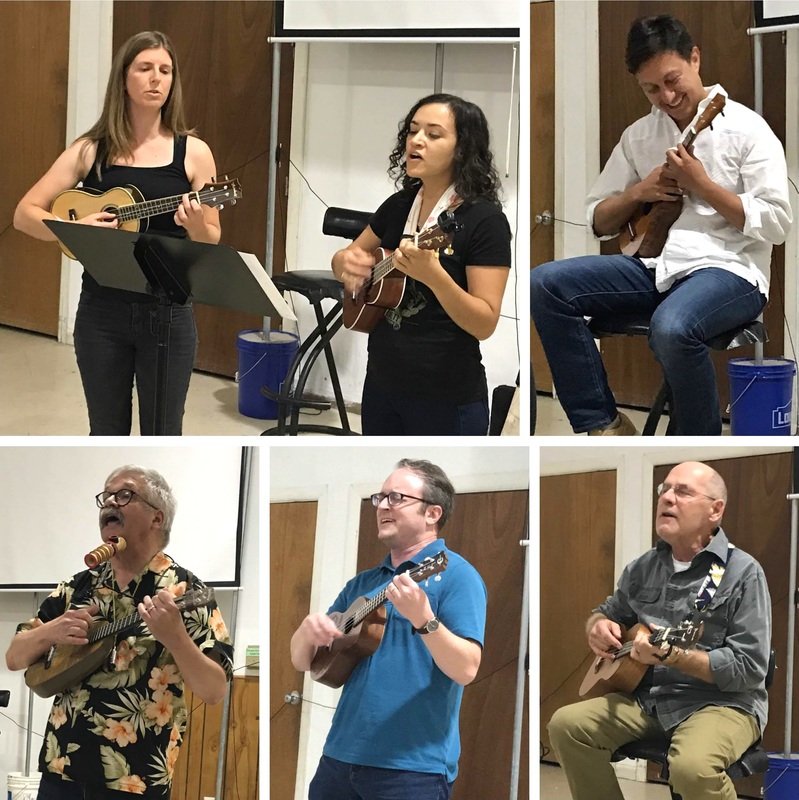 Before we launched into learning our new song, we kicked off the meeting with introductions, local ukulele news and ukulele shows around town. The group warmed up their fingers and voices, as always, with Bob Marley’s beloved and optimistic classic, “Three Little Birds.” Afterward, together with guest musicians Bill Jones on button accordion and Aaron Lewis on bass, Bob played through “All You Ever Do Is Bring Me Down,” to demonstrate the arrangement he’d prepared for us. Bob then took the group through some helpful drills on the chord progressions and strumming pattern, and included some variants on the two chords to give the sound a little more depth. We also practiced some harmonizing, since The Mavericks’ lead singer Raúl Malo has such an amazing voice, and we wanted to do the band justice (and we did!). To play along with us, you can download the lyrics and chords for our arrangement of “All You Ever Do Is Bring Me Down” or download a copy of the presentation and instruction guide (what we project on the screen for all to follow along, including exercises and drills). After playing and singing together for a while, we took a break to enjoy some great open mic performances. Both The John Davenport and Sho H. played fantastic originals for us, and we truly enjoyed creative and cool covers performed by Gaige and Matilda. The group is always warm and receptive to hearing what our friends are working on during the open mic portion of the evening; we look forward to you sharing next time, too! 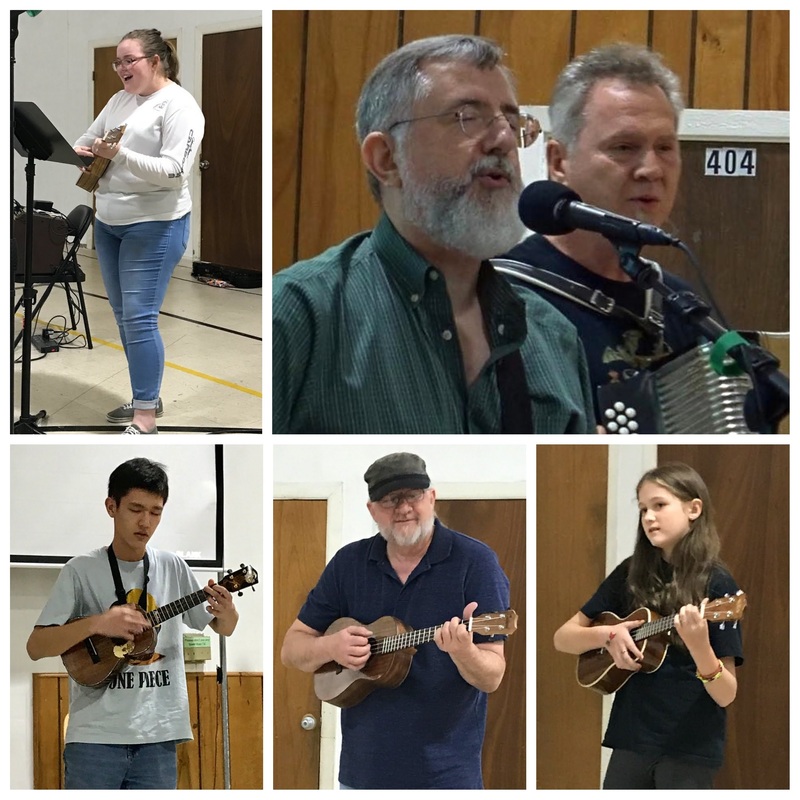 This entry was posted in AUS activities on April 15, 2018 by Austin Ukulele Society.